60x60, Acosta thru Campbell, received airplay July 26, 2005 on Canary Burton's, The Latest Score at WOMR 92.1 FM Wellfleet, Massachusetts. Tracks from the 60x60 (2003) will be broadcasted on the NPR radio show, Theme and Variations, hosted by William Everett. Broadcasted on YPR with an Internet simulcast, Theme and Variations combines classical music and literature. on Sunday, July 3rd at 11am MST, the radio show will focus on "shorties" -- micro-fiction (2 pgs and less) and very short musical works. Listen to Frank Oteri being interviewed by John Schaefer on the archived radio show, Soundcheck at WNYC talking about short durational pieces and the 60x60 project. The 60x60 project is receiving weekly airplay on Max Shea's Martian Gardens Including our encore performance of the 2005's Radio Request Extravaganza on June 12th, 2005. See the play list here. For 6 months, Max Shea has been using the project as a road map to finding and broadcasting the longer works of the composers included on the CD. 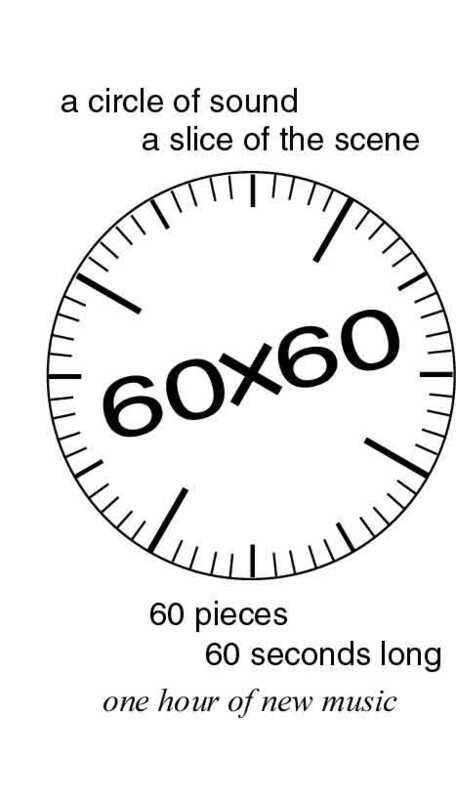 60x60 is a concert containing 60 compositions from 60 different composers, each composition is 60 seconds or less in duration. These 60 recorded pieces are performed in an hour long continuous concert. The performance is played in conjunction with a synchronized analog clock marking the passing of each minute. At the top of the minute begins a new composition from a different composer. This compact disc adaptation of the 60x60 project is created for 3 different listening methods: The first is sequentially; each work in listened to in a designed order. The second is on random play, where there is no order. And the third is to listen to each work repeatedly for an extended period of time. Each method brings a different view and understanding to the composer's work and vision. The goal of this project is to highlight many composers. The project presents a cross-section of contemporary music, including the various styles, aesthetics and techniques being used by the composers of today. 60x60 is a circle of sound, 60 pieces representing a slice of the contemporary music scene. The works in this volume of the 60x60 project represent the submissions received for the year 2003.